This is one of Le Grand Maitre’s most famous songs and his most powerful. 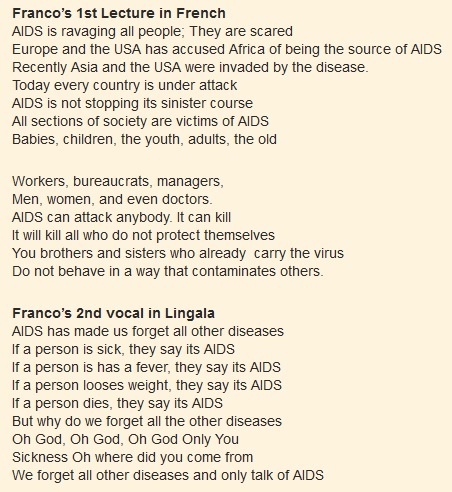 It was sung in 1987 at a time when the AIDS virus was a new phenomenon, perhaps well known for only about 2-3 years. 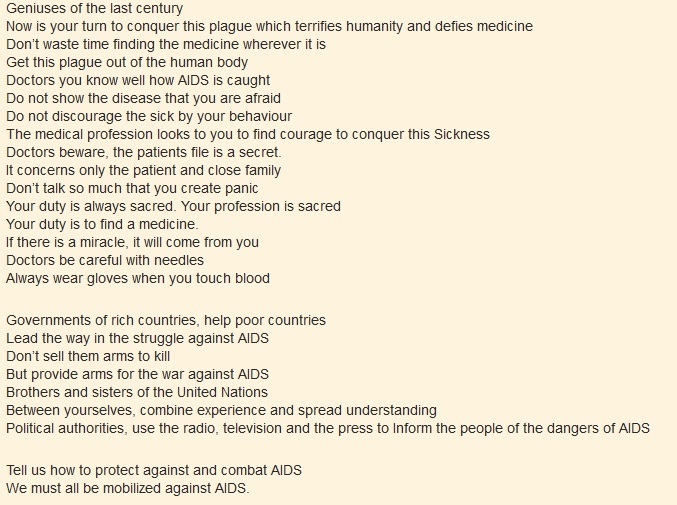 AIDS was a new disease at the time,and negligent governments provided very little information, the song was a powerful, informative and much needed message. As such the disease was spreading rapidly. The song was thus a powerful, much needed message at the time. It exhorted everyone to take the disease seriously, governments to educate the people and urged everyone to change their behaviour. Amid beautifully interwoven guitars, Franco thunders his message like an old testament prophet telling Sodom and Gomorrah to repent or perish. Even those who could not understand Lingala or French got the message: “AIDS is serious business”. The song was recorded in Brussels. In the Song, Franco was accompanied not by his band TPOK Jazz but by the band Victoria Eleison led by guitarist Safro Mazangi Elima. TPOK Jazz were in Kinshasa at the time. Interestingly, Franco used the same guitar arrangements and same vocal tunes as he had used for his notorious song “Jackie” which he had sung Nine years earlier in 1978. It was the song that was considered so immoral that it landed Franco in jail along with the band members who participated. By re-purposing the song, Franco may have been making amends for his earlier error. The song “Jackie” starts at the 16:45 mark of this video. This entry was posted in Franco & TPOK Jazz songs, Songs and tagged Franco & TPOK Jazz songs, Franco Luambo. Bookmark the permalink. 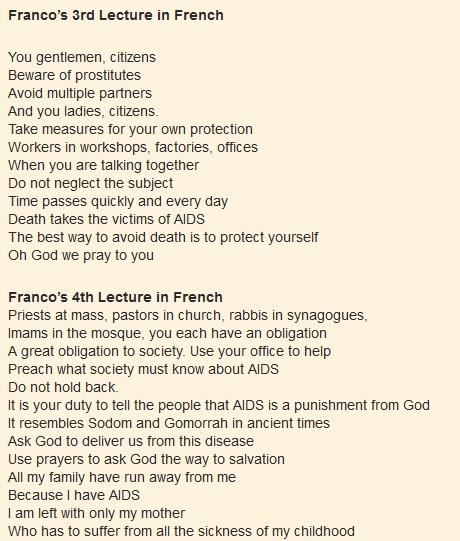 Franco had the courage to tackle topics considered controversial in our society.Talking about AIDS when he had it and the levels of stigmatization and ignorance about it were flourishing truly makes me conclude he was a legend.We are still listening to your music mzee for i know you are watching us. 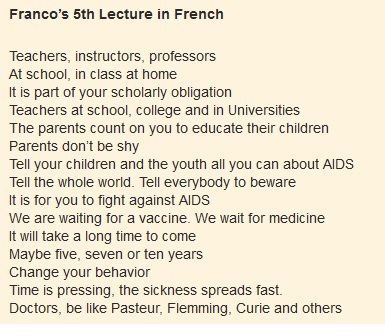 Long gone Franco but your message is and live educative and especially now aids is wide spread. ooh my,.. this is the kind men we need in the current society. Franco, may God rest your soul in peace. I love your music, its real, its educative….. true your words are. I have always wanted to hear Franco’s message of this song in English. This man recognized the dangers of Aids long before anyone did. What courage! I don’t think Africa will ever have a better musician. Long live your work. Will miss this old time great, however his music still lives and keep us reminded. RIP Franco. I salute you for the good job you did during your life time. Am fond of TP OK music since my childhood. I have been enjoying the beats very much but of recently am getting confused as I get translations of Luambo’s songs. 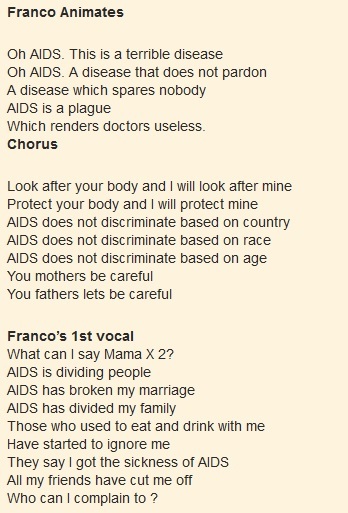 Some songs like this one looks as a speech of UN secretary General to the World Community about AIDS. I perceived Luambo as only a Talented Man, but now I do understand that he was beyond that. Apart from normal talent, I can see intelligence and hard work spirit in the man.I have not managed to know his education history, but I wonder seeing Universities conferring ceremonial degrees to people doing politics and delivering speeches that I believe were prepared by others, now one thinks of conferring one to Franco even in his absence. I can see other people receiving Noble Prices for works that I be believed do not exceed Luambo’s. Dear Almighty God, you real know what Luambo did to the world, in terms of teaching and entertainment may your powers give this man of yours the respect he deserves. 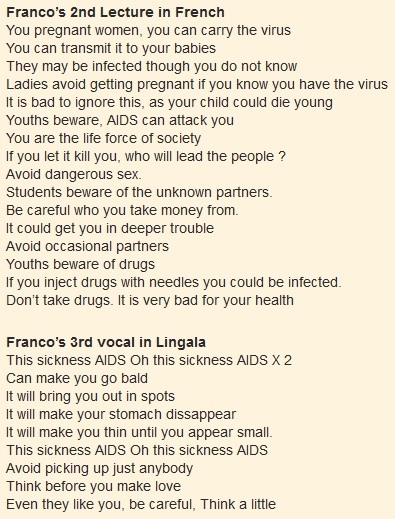 the way Franco composed this song;of which remains to be of the centuries abt the HIV&AIDs malady,clearly confirms he Prophesied mankind wil nt get a complete cure on it} b ur own guard,live long Franco.Mungu atubariki. True to his words it has taken this long but still no vaccine nor cure. We appreciete the research though. Soon we’ll be there. We really need another Franco on this Ebola disease. Franco R.I.P. You were bold enough to speak so openly about AIDS and your status. bana ba congo! mbongo nayo nani? franco…..were you are i salute you man…..rest in peace. it was probably franco’s greatest song of the century! oops,didn’t know “attention na sida” was such a powerful song,with such heavy cautious words.Did anybody heed to His words during this time in 1987? Francois was just on his own world musically,pure talent and his successor is not yet born,RIP papa le’ pesidant Lumbo Makiadi, you’ll forever live in my rhumba world,dont call it rhumba if TPOK song isn’t played….lov u papa..